Hi Guys i am looking for some info i am having trouble getting my AI to walk on the ground and act like AI and anytime i try and add the controller when i move the character moves this is great if i want to use him as the player but i want him to be the AI and walk around and stuff all the collision is correct and what not. 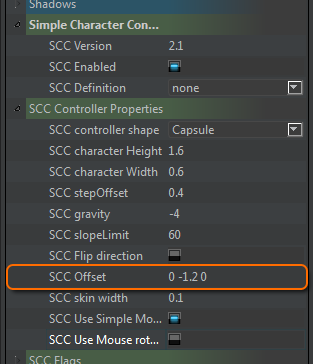 On the action properties for SCC and PhysX Player Controller, there is a property called offset. This takes 3 values for "x y z". On the Y value, set the value to say, -1.0 and see if this moves your character closer to the ground. Leave the X and Z values as 0 for this instance. Here is an image to help. This can also be applied to the Simple Character controller action aswell. If you spawn a character, then there is a command to set the offset there. Another one of our users had problems with there AI aswell. A character that is scaled down from a large size using the gizmo or translation panel can make the AI do weird things, instead you need to use the mesh editor and import your character into there and rescale the base meshdata. 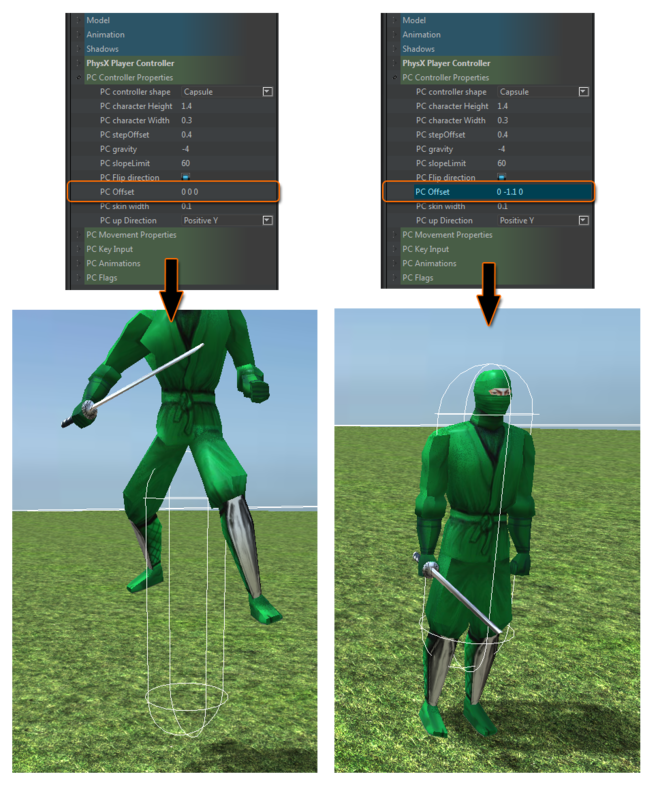 > Open or Import the character into the mesh editor using the toolbar buttons. > Open the Mesh File Editing property header and change the Scale Offset into “0.01 0.01 0.01” (or whatever valid value scales your character into range) and hit return. > Now press the save button to save back to the mesh and skeleton file. (Skylines unique feature of being able to scale skeletons while keeping animations intact ). > Your AI should be good to go now. This really should be made into a tutorial on the wiki, as it seems to affect alot of users. The FPS Template has AI Orks you could use as an example if this is a script related issue. Which action's do you have on the AI Npc? What is the micro script? even better If you could post your scene to us and we can take a look at it for you. "Idle" "Walk" "Run" "Jump" "Attack1"
looks like you need to remove the "physx player controller" from the orc. 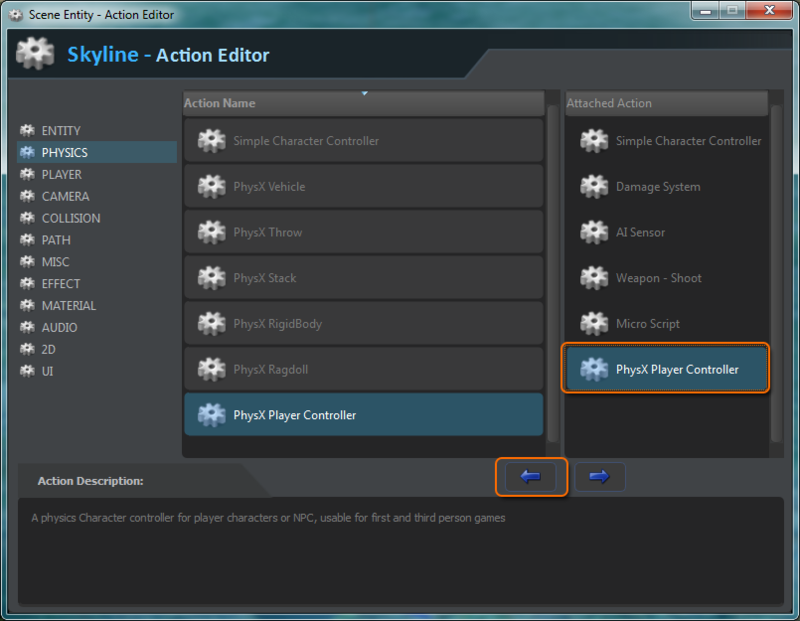 Step 01) To fix this, select the character in the scene; right click and choose "Action - Editor". Step 02) When opened, select the Physx Player Controller from the Right list and press the arrow pointing left(left button). This will remove the action. Step 05) Change the animations to match your characters. Since the AI is programmed in lua, the animations need specified in lua. If you want to start from scratch. 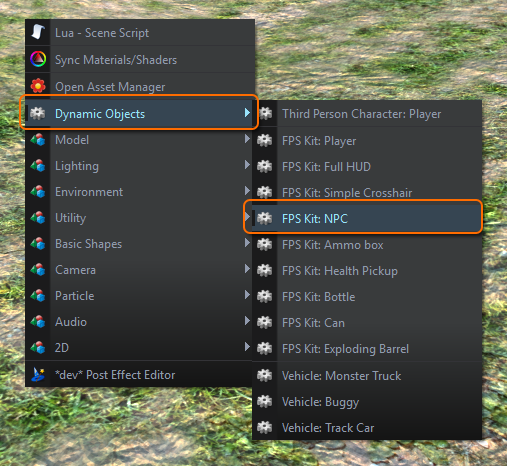 Step 01) RMB+Click in the scene and go to "Dynamic Objects->FPS Kit: NPC", perhaps you added the player version. Step 02) Then change the mesh to the new character. Step 04) Open and enable Microscript, and change the names of the animations inside the script. (this is the same as the script image above). Remember, this is an FPS AI, so for a melee AI. It will need programmed further. Works great will just need to work out how to get him to attack with his axe but i don't see anything in the LUA about attacking. To attack you will need to modify the script, there is an event function called shoot() that gets called when the npc shoots. In the character settings i see there is a setting for the camera to orbit the player if untouched for so long great feature btw but does it work just now or will it be added later. it is not added yet, but the camera system is now more advanced and we could build this feature into the camera entity instead to keep the system more modular and therefore more expandable. Hi guys any idea what the issue is with the new scripts its as if when i get close i am tangled in its web so to speak haha as i walk backwards i drag it with me. 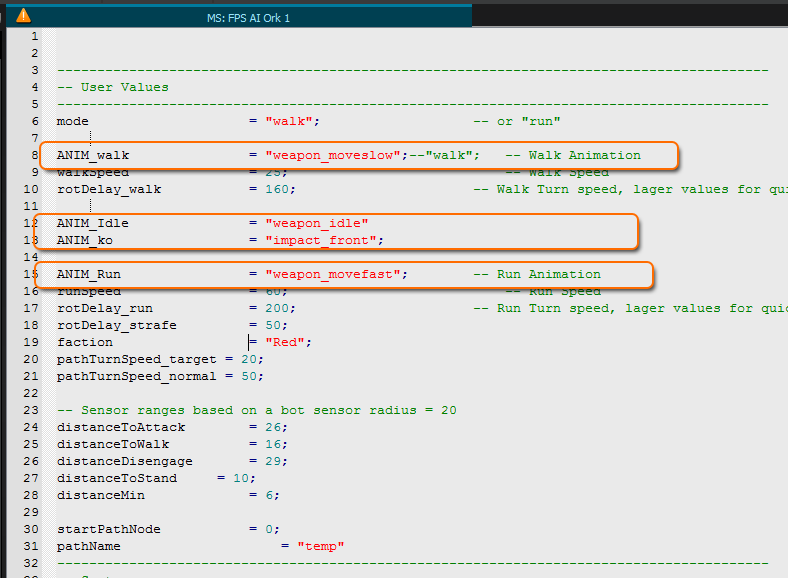 Also not sure whats wrong with the run animation as the character does not have a run animation only walk so i set it to walk it also does it if i say do not use. It must have something to do with the hitbox or damage as it wont crash it i just let the zombie kill me over and over but when i try and kill him that's when it crashes. When using the FPS with the script it doesn't work properly also you get a crash as soon as you try and shoot the zombie. Ok a few things to check, make sure the detection flags are correctly. The fps player is set to 2 so zombie prey flag should be set to 2 also use the zombie fps script. btw you have got the new skyline exe and fps player preset, released yesterday? Check your capsule by using the scene setting physic debug flag, as the spiders capsule may be incorrect. Also play with the turning speed property and detection ranges as the spider should be fine. Probs best to sling me the presets and other files so I can have a look for you and see what wrong for you. the only problem we encountered was that once the player was KO and then respawned the zombies would not re-attack. will fix this. 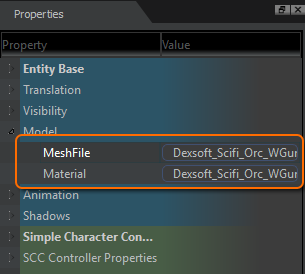 Instead of opening the script to check the properties, have you checked the dynamic properties tab as this can hold different properties as to what is found within the script. You can find this in the row of 3 icons in the top of the property panel, the middle one holds the dynamic properties. Please check the settings you looked for in this section as well. It is strange why it crashes when shot. Have you tried a different zombie mesh perhaps? Please could you package your scene and that zombie and send it our way? then we can test to see if the crash exists on our end as all the tests we have tried seem to be working. Perhaps it is something specific. ok, I think I will leave all this alone for awhile. I'm crap and don't know what or how I'm ment to do any of this stuff lol..
and as tattie is having issues i think it best i don't mess with it sadly lol..
i know i know I'm to stupid haha if there was voiced tuts from start to finish i would probably still screw it up lol. when will the patch become an update automatic with skyline? because i hate adding folders to softwares and alike lol, sorry. We will focus on getting the auto update back and put down the object pool feature ( unlimited scene entities - memory efficient) SPs flu has knocked him for 6 but he is back at the workstation. We would have like to get the pool and a few other features released but this was taking a bit more time than we hoped and the temp exe were only to get a few of the user requests out to you. Please bear with us and we should get the update, updating with a new build number. @Tatty SP will have a look at the frame thing for you after the update is back online as I make sure he can make it a simpler process. Tatty, just had a look at the new video. Note 1: You will need to use the dynamic properties to change the values on the zombie no need to open the script. The dynamic properties it the little cog icon at the top of the entity property panel. By setting the attack distance to 2 and detection prey flag to 2.